With nearly 400 stores across five countries, we're a one-stop source for domestic, international, and freight shipping services. 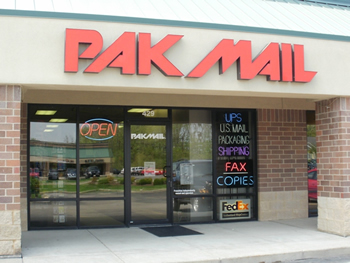 When you visit your local Pak Mail in Fort Wayne, we'll find the most cost-effective, safe way to pack and ship your items, whether it's by air, ocean, or ground. Easter is early this year so hurry in to make sure the Easter Bunny can deliver it on time.We will be hoppy to help you ship all of your Easter gifts to your loved ones near and far. We have lots of boxes in stock to fit your baskets filled with goodies. The post EGG-STRA SPECIAL CARE appeared first on Pak Mail Fort Wayne. Proudly serving the Fort Wayne area for 19 years. We are your packing, shipping, crating & freight solution. Located at the west end of the Dupont Village Shopping Center behind Casa Grille restaurant and next to Fort Wayne Custom RX. We help our customers do everything from sticking a stamp on a letter, to packing and shipping delicate crystal, to crating heavy machinery. We offer FREE shipping estimates and FREE local pickup for large items. When you ship with us, you'll have the opportunity to compare our negotiated rates from our preferred network of carriers (DHL, FedEx, UPS, USPS, and more) and numerous delivery options to provide you with a reliable and efficient delivery method. Select from the top carriers to ensure safe and secure delivery each and every time. Whether you need to ship a grandfather clock, electronic equipment, a small apartment or artwork, we have the expertise. We provide estate packing and shipping services and handle all of your sentimental antiques and artwork with the specialized care they deserve.